Here are 15 interesting handy tips to help you make the best of your Google app on your mobile device. 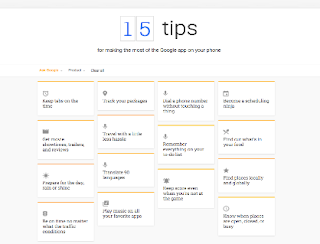 More details on each tip is available on Google Tips page. Some of the things you will get to learn from these features include: how to make a phone call using a simple voice command, access your google Calendar and add events by tapping or asking, set reminders while you are on the go, check the arrival time of your packages, search for places locally or globally and many more. 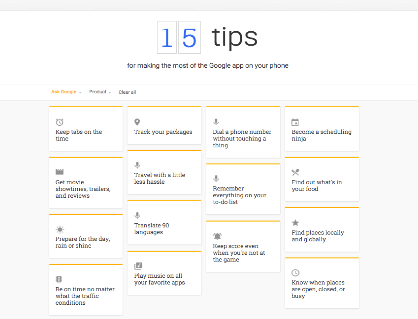 Below are some of our favourite tips from the list, check out Google Tips page to learn more about other hacks to use with Google app on your phone. You can easily set timers and alarms with a simple speech command. For instance, try saying ‘ Ok Google, set a timer for 12 minutes or Ok Google wake me up at 8’. You can ask Google to show you events in your calendar by saying ‘Ok Google, what’s on my calendar today?”. This feature allows you to get translations in 90 languages by speaking or typing. You can search Google for places of interests using speech commands with the name of these places included. e.g ‘ Ok Google, where is the nearest coffee shop?’.